Mothers With Attitude: "Let Him Try It"? Let's Not. A seemingly rational sentence used in many ARD committee meeting across the states routinely. Then the parent begrudgingly signs “accepted” on the "parent" line most every time. The constricting nerve in the back of my eye that alerts me to imminent danger is soothed with that one line every time. Aggressive convincing by the ISD personnel to use the optimistic approach has concluded my three sons’ ARDs countless times over many years. Being a positive person and using positive reward systems for kids is a good thing. The bad thing is that wise parents know our kids best and know what is a dangerous situation for our students. But we hear it again and again: “Let him try it and see how it goes.” Even wise parents get worn down by the professionals. My boys were adopted at 3 and 4 and 8 years old from abusive, neglectful bio parents and then foster parents. The 3- and 4-year-old are in high school now. They need much emotional support and adult supervision to be successful. For the trauma they have endured, they are truly “at risk” every time they walk out our front door into the world. They get relatively little support in high school special education, yet usually make it through difficult days with their spirit intact. Until last week, our 17-year-old ADHD/ODD/ED/LD/Language Impaired child never had to visit the principal because of trouble he caused. But three years of good behavior, ferociously “hanging in there” like the little kitten on the greeting card, controlling his impulsive desires, not acting out, means nothing in our “Zero Tolerance Policy” ISD. Coming home, he followed other boys, teasing and struggling with a girl over a six-foot flagpole she carries home on the bus for her school organization (called Color Guard). The tip broke and she and her parents went to the school to report this the next morning. Our son (seen as an adult at 17) was given a bus suspension, must take a bus safety course with a parent, and was given a citation by the deputy for vandalism and ordered to appear in court to receive a community service sentence and pay court costs. We “wise parents” are not doing the warranted “I told you so” dance. We are addressing the boys’ actions as wrong and trying to teach them about intolerance in the world when one lets impulses control you. It does not matter what the ARD committee decides when the deputy is involved. 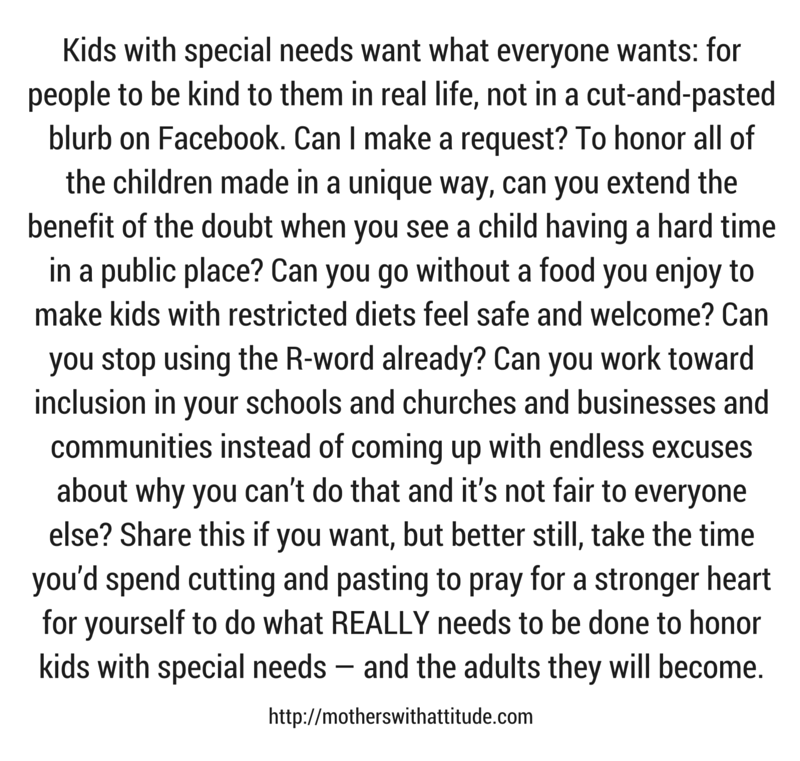 And we “wise parents” learned that the safety net we thought existed for our special education students has, in reality, gaping holes. True wisdom comes with a high price tag.